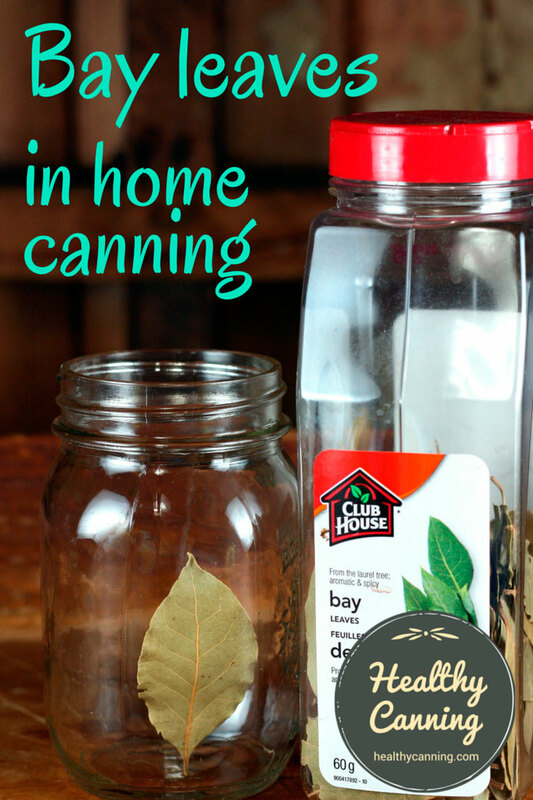 Bay leaves are great for home canning. Many people believe that we eat with our eyes and noses first before our mouths. 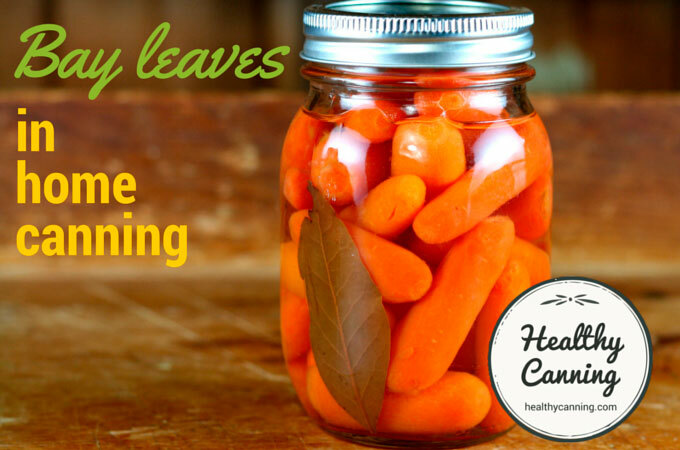 A bay leaf makes a jar look like that extra detail of care was taken, and, there’s a wonderful aroma that rises out of a freshly-opened jar of home-canned carrots or green beans with a bay leaf tucked into it. The bay leaf elevates the flavour from boiled banal to quasi-gourmet. 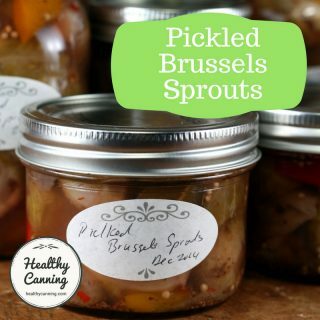 As a dried herb, they are one of the safe, approved ways that you can tweak the taste of a canning recipe. There are some people who won’t necessarily like the taste of a bay (ala laurel) leaf. That is understandable — everyone is different; there are people who don’t like the taste of lemon, or pepper, or ketchup, or coffee either. But far more people just don’t even think of the poor, ignored bay leaf anymore at all. There were a generation of people who grew up on withered bay leaves from a 10 year old jar from the back of a hot cupboard, and who therefore logically concluded that a bay leaf added exactly nothing in terms of flavour to a dish. And those leaves wouldn’t have. Yet, the same people adore the spice mix called “Old Bay”, without connecting the dots about what the “Bay” in the name refers to. To be fair, their marketing now invites you to believe it refers to “Chesapeake Bay” but it’s actually originally in reference to the ground bay leaves in it. Ball Blue Book Guide to Preserving. Daleville, Indiana: Hearthmark LLC. Edition 36. 2013. ">Blue Book 2013  Ball Blue Book Guide to Preserving. Daleville, Indiana: Hearthmark LLC. Edition 36. 2013. This would be a good point at which to clarify that the bay leaf meant here is the classic bay leaf. There are at least two others called “bay leaves” that you may come across. There’s a West Indian bay leaf (Cinnamomum tamala) which is a different kettle of fish altogether; it lends a cinnamon taste. And then, there’s a California imitator. That California imitator (Umbelluaria californica) bay leaf has smooth edges to it. Julia Child hated California bay leaves; she thought they had a disagreeably strong flavour. The bay leaf being discussed here for canning is instead the “real” thing, the classic bay leaf (laurus nobilis) from laurel bushes. It’s easy to identify them: they have wavy edges. They are often imported from Greece or Turkey. They also grow wild in Italy and France. It would also be good to clarify that relatively “fresh dried” bay leaves are meant. Not old dried ones that have lost all colour (and flavour) and gone brown, purchased sometime shortly after The Sound of Music first hit the screens. Good, real bay leaves that are relatively “freshly dried” provide a foundational flavour to food. People may never be able to identify it exactly, but it will be there in the background, playing a supporting role to harmonize with other flavours. A bay leaf releases complex aromas that stand up well to long, hot cooking, making it ideal candidate for pressure canning. 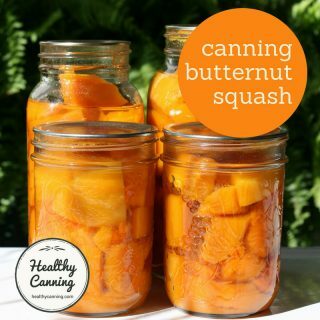 So go ahead and tuck a leaf into a jar of carrots, green beans, tomatoes, mushrooms, a jar of soup, or meat before you put the lid on the jar and pop it in the pressure canner. Something about pressure canning in a jar really brings out the best in a bay leaf. A bay leaf in a pickled preserve — such as cucumber or zucchini pickles, pickled cauliflower or brussel sprouts, antipasto mix, etc, can be great too. You may also see someone from the Safe Canning Police brigade come along and say, “you’re gonna kill somebody” by putting a bay leaf in your carrots. We are allowed to tweak canning recipes with dry herbs, which a bay leaf is. Here is an excerpt from a University of Alaska Extension publication suggesting up to 2 bay leaves per 1/4 litre ( 1/2 US pint / 1 cup / 8 oz ) jar. van Delden, Kari. 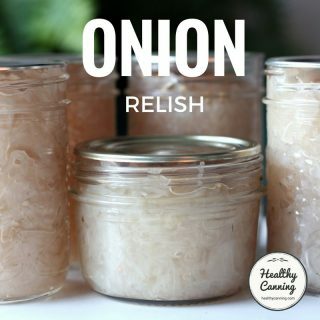 Add Variety to Home-Canned Fish . University of Alaska Fairbanks Cooperative Extension Service. FNH-00224 . Revised April 2012. Blue Book 2013  Ball Blue Book Guide to Preserving. Daleville, Indiana: Hearthmark LLC. Edition 36. 2013. Dill slices (page 69); Lemon Cucumber Pickles (page 69); pickled onions (page 70); Spiced Tomato Soup (page 95). Bay leaves have just fallen off the cooking radar in general — as many cooks will confirm — and that’s perhaps one of the reasons for their disuse in home canning recipes. 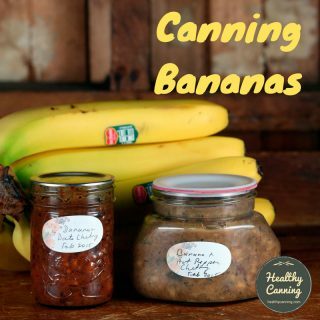 But most of the “authorized” home canning recipes sprang from a food cultural context in the United States where bay leaves were not a common part of the vocabulary. In that vein, the “authorized” collection of home canning recipes essentially has to try to, lets’ face it, be as unadventurous as possible in terms of flavour in order to appeal to the widest audience, and it would just take a few vocal allspice haters, or nutmeg haters, or bay leaf haters, to cause Ball or Bernardin to strike that ingredient from a recipe for everyone just to make their lives easier by silencing the complainers. So if you’re not a bay leaf fan, keep on enjoying not using them, ever, in anything. If however you are a bay leaf fan, don’t let a vocal minority of bay-leaf haters silence you: try tucking a good, fresh real one into your jars from time to time before processing. 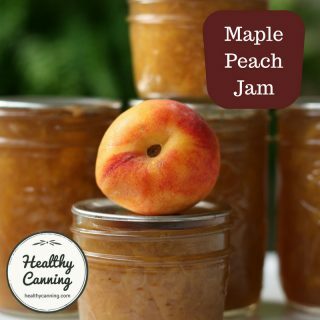 You may find it just gives that extra “je-ne-sais-quoi” to your jars to elevate them to gourmet, while still keeping you solidly inside safe canning guidelines. Berwick, Bonnie S. Bay leaf: Should it stay or should it go? Washington Post. 30 September 2014. Retrieved March 2015. 1. ↑ To be fair, their marketing now invites you to believe it refers to “Chesapeake Bay” but it’s actually originally in reference to the ground bay leaves in it. 2, 3, 7. ↑ Ball Blue Book Guide to Preserving. Daleville, Indiana: Hearthmark LLC. Edition 36. 2013. If that is indeed owing to the small bit of bay leaf you put in a jar, and not to something else like traces of dish soap, etc, that it may be how your taste buds perceive the taste / aroma of bay. I googled to see if anyone else reported, in general, ever perceiving bay in that way, and couldn’t find anything. Puzzling! Here’s a photo of the ingredient list: https://upload.wikimedia.org/wikipedia/commons/5/52/Oldbayplastic.JPG . You’ll notice the bay leaves (aka laurel leaves) listed right after the black pepper. Its name, Old Bay, picks up on both the bay herb in it, and its Chesapeake Bay origins. Despite that, look at what the first ingredient is: salt. 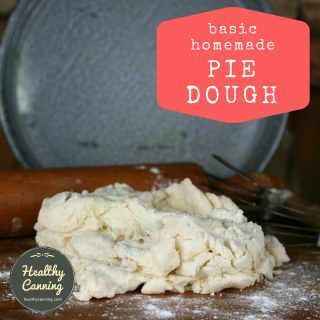 That may be the real reason we all love it, there’s about 650 g of sodium per teaspoon. :} Cheers!